Space is the Place return after a cosmic journey to the far reaches of the observed universe and beyond. The mission: find and bring back to Earth fresh new sounds and alien technology. The purpose: to unlock the ancient secrets left behind by our ancestors. 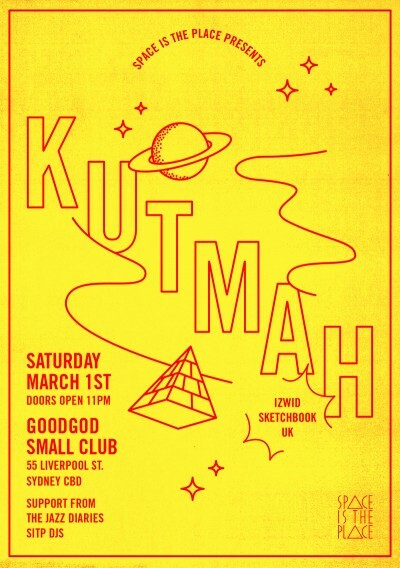 Landing back on Earth on 1st March at Goodgod Small Club, SITP presents music selector extraordinaire, and probably the best DJ you never heard, for the very first time in Australia KUTMAH! Kutmah is a Los Angeles native and fundamental part of the now infamous LA beat scene finding a place amongst some of the most inspiring and forward thinking beat makers of a generation. Kutmah has relocated back to England from LA and currently resides in London where he now holds down a show on NTS Radio, and has furthered his reputation as one of the most fearless selectors around, earning respect from heavyweight djs such as Gilles Peterson and club nights such as Fabric and Boiler Room. Kutmah is now touring across the world, playing shows with J-Rocc, The Gaslamp Killer, Flying Lotus, Gonjasufi, Dabrye and many more and we are hyped to have him step into the intimate surrounds of the Danceteria for one special night. On support duties will be The Jazz Diaries DJs, Jitwam and Casey, and Space is the Place DJ’s, Sofie and Prize. Doors at 11pm till the early hours of the morning. Here’s a taste of Kutmah’s immaculate selections live from Boiler room headquarters.